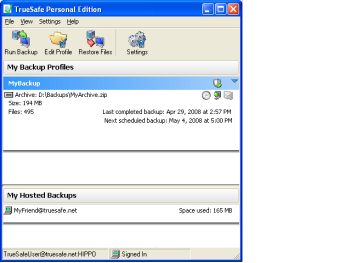 TrueSafe allows you to backup your data to another computer over the Internet or to local storage (e.g. a USB drive). TrueSafe backs up your computer files, providing you with protection against loss, corruption, and accidental deletion. TrueSafe is designed for people who don't want to hassle with backups, it is easy to use, and runs automatically in the background. Backup your data to another hard drive, USB drive, USB flash device, or even securely over the Internet to another computer running TrueSafe. Backup your data to the computer of a friend or family member. You can also host their backups on your computer and help your friends and family stay protected. Saving your files offsite provides you with a much higher level of protection. Other highlights include: comprehensive backup scheduling, including auto-start when you plug in your usb device, e-mail notifications, zip and native format archives, suspend/resume support, compressed archives, and encryption. It is easy to use, and runs automatically in the background. Backup your data to another hard drive, USB drive, USB flash device, or even securely over the Internet to another computer running TrueSafe. Saving your files offsite provides you with a much higher level of protection. Other highlights include: comprehensive backup scheduling, including auto-start when you plug in your usb device, e-mail notifications, zip and native format archives, suspend/resume support, compressed archives, and encryption.